Marie Kondo’s book, The Life-Changing Magic of Tidying Up, says the best place to start tidying in your home is your closet. Well, I did it. Oh-my-goodness. That was a HUGE job, but it didn’t hurt nearly as much as I thought it would. Phew. I’m glad it’s over and I can’t believe how clean I feel – not just because my closet is clean, but my overall life is starting to feel cleaner, and I love it! 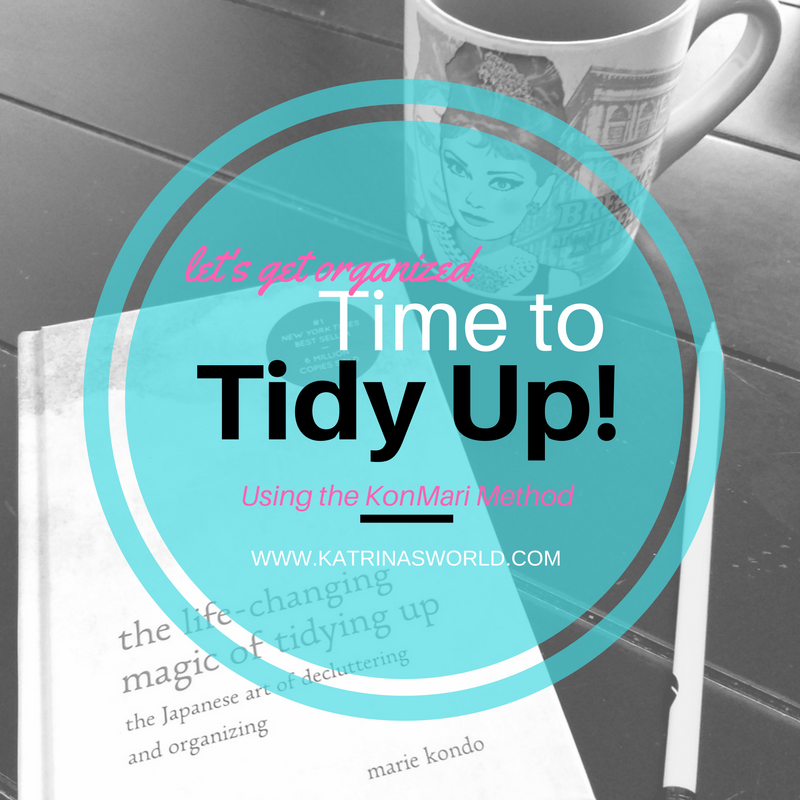 Are you ready to begin tidying your life? Well, here is how you at least tackle your closet. First of all, Marie says you should gather every last bit of your clothing in your entire house and put it all in one pile on the floor. I laughed out loud when I first read this. I remember thinking that I could just leave a few coats and gloves in the downstairs closet and not worry about them, as well as keep my swimsuit in the laundry room – but the book says to gather every last bit of clothing – gloves, hats, coats, everything. If you don’t get every last piece you won’t fully immerse yourself in the process…I drug my feet because it seemed like a lot of work, but eventually I grabbed a laundry basket and gathered everything and hauled it upstairs to my room. I took every single piece of clothing out of my closet – shirts, jeans, fancy dresses, suits, bras, purses, scarves, etc.. – EVERYTHING!!! I even pulled out my precious tubs of maternity clothes (which I had 3 giant plastic tubs worth) which I swore I would never get rid of. The dust on top of, behind, and around these maternity tubs was thick, and I was beyond terrified to get rid of any of it. I’ve had such a journey the last 11 years of being a mom and so many memories are tied to those maternity clothes. I could not imagine going through them, let alone getting rid of any of them, but I pulled them out of the closet and piled them up with everything else. After it was all piled up on the floor I sorted it into clothing types and tackled my shirts first. 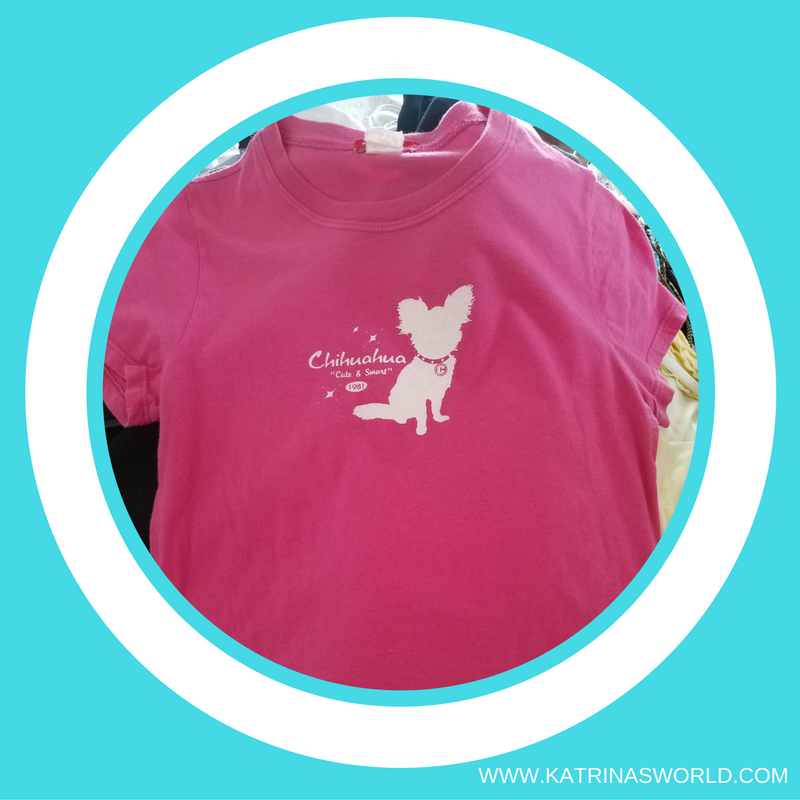 I was doing great at discarding shirts that were lumpy, stained, pilled, and had holes in them until I found the pink glitter chihuahua shirt. I got stuck. I sort of freaked out. I put it in the discard pile and then I grabbed it back out. I panicked. That shirt has such deep memories. Does is spark joy? Yes, it does. It sparks all sorts of memories of a wonderful life I’ve had with my spouse. I got that shirt while I was dating my husband and was dreaming of marrying him, having kids and of one day having a little white chihuahua that I would name Lucy. For real. I loved pink, glitter and little dogs and felt like my whole life was ahead of me. Great memories that make me wish life was simple again. I cannot part with that shirt, even though I’m fairly positive that I”ll never actually wear it again. 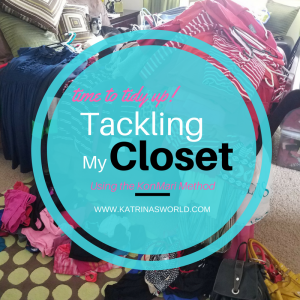 Back to my process – I started to fill up bags and bags of clothes to be donated – it’s was liberating and felt wonderful! When everything else was sorted, I finally tackled the tubs of maternity clothes. I had to scrape off a layer of dust just opening them. Ewww. I plunged ahead and was really surprised when I made it through the first tub and easily discarded all of it. Nothing sparked joy. All of the items in the first tub were very big and out of style – they were 11 years old and from my first pregnancy – I was gigantic when I was pregnant with my oldest. I hated everything about being pregnant with him. I was uncomfortable, sick all the time, hungry all the time, wore very big maternity clothes, and when I picked them up and examined them, they gave me a feeling of yuck. In the donate bag they all went and this process continued until I came to the last tub with all my cute clothes from when I pregnant with my daughter. I loved being pregnant with her. I was super thin because she made me sooo terribly sick all the time that I could barely eat, it was summer and I love summer maternity clothes, and overall I felt like a rock-star mommy. It was one of the best years of my life. I loved the attention of being pregnant, I felt cute the whole 9 months, and I was elated to be having a girl! I loved all my maternity clothes I wore during that time – they were colorful, cute, and I would wear them all again if I had another baby. I even loved my maternity swim suit – and honestly, who can say they love a swim suit? Needless to say, I kept about 12 items, including my swimsuit and that was all I kept from my 3 big maternity tubs. These items fit in a small diaper box. I’m so glad I took the plunge and opened up those bins – because it taught me I was holding onto memories that I didn’t need to hold on to anymore. I don’t plan to have any more kids, but if I do, then I still have a few cute items that I love dearly. I’m sure at some point down the road, I will discard that box, but for now, I’m so proud of myself for purging 3/4 of a category of things I had that were not exactly what I thought. I didn’t need to take up a huge space in my closet holding onto things that I didn’t really even like when I further examined them. Again, it’s liberating to get rid of them! I also know that someone else could use all of those clothes that I no longer needed, so I posted 3 garbage bags of maternity clothes size Small, Medium, and Large on a local Free Facebook group that I’m a part of and all 3 were picked up the next day by ladies who needed them. It’s a win-win! It only took me 3 hours to complete my closet. I spent the next hour vacuuming, dusting and cleaning my closet floor which had not seen the light of day in probably 6 years. When you have so much crammed in a tiny space it’s more effort than it’s worth to clean under and around it. Right? I love all the white space on my side of the closet now. Love it! I learned a lot about myself by the items I decided to keep. Sorting through your clothes tells you a lot about who you are. I discarded a lot of things that I’ve held onto for a long time – fancy dresses, high heels, jeans, suit jackets from my working days, etc. I held onto my leggings, tunics, yoga pants, athletic gear, and running shoes. Wow. It’s weird to even write that. My fashion sense and lifestyle have changed a lot in the last 20 years (yes, there were things in my closet that I’ve had for 20 years). Honestly, I’m not sure what this says about me. I’m still thinking about it and mulling it over in my head. My husband did comment that I used to dress a lot fancier when he first met me. Of course I questioned him about that and he just said it was an observation, but it did worry me. Am I looking to mom-ish? Just stuff to think about. Wow, who knew that tidying my home could go so deep? So, what has tidying taught you? Have you sorted your closet? How did that go? 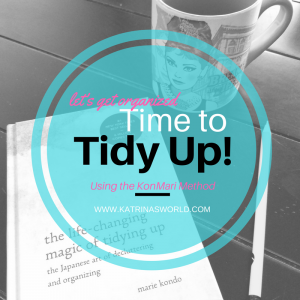 Can’t wait to hear all about your tidying journey…. I was so excited to get started with my tidying project that I had no problem sorting through stuff in my cabinets and begin the joyful job of discarding. For me, this job is fun. I do find joy in discarding objects that no longer serve a purpose or have a use. You might have a much harder tine discarding items – my husband, for example, has a hard time letting go of things. Just the other day we were sorting through that big box of cables, cords, old computer parts, etc that everyone has laying around. We have a pretty big box full of these things to go along with our many other electronic devices and because my husband is a nerd we have a lot! Yep, I just called him a “nerd” and I mean it totally lovingly. He’s amazing and I’m so glad he understands computers! Anyways, since I was dying to get a jump on the discarding process I drug my poor, unsuspecting husband to the basement to begin sorting through the box of cables and then to sort through our big pile of old computers, hard drives, printers, etc that we could recycle and get out of the house! While I had no problem finding a ton of stuff to discard, my poor husband sorted it all and then sheepishly said he needed to keep most of it! :) It was adorable actually! We had multiple TV cables from DirectTV still in the plastic packaging that were exact duplicates and I was ready to discard every single one, while my husband was worried we might need them ALL someday. It was cute, and made me giggle. Somehow I negotiated with him to keep just one of each kind, phew. I did learn that everyone has a different way of looking at items around the house and the key is identifying it’s purpose and being ok with letting it go if it’s already served it’s purpose. At least I know that I have no problem letting go of stuff, which I’m happy about considering the journey I’m about to go on, but the best words I’ve read so far into Marie Kondo’s book, The Life-Changing Magic of Tidying Up, are “we should be choosing what we want to keep, not what we want to get rid of.” Like focusing on the good. I have a very hard time doing this in everyday life. I tend to focus on the bad in a situation and in people. Isn’t that awful?! I love the idea of looking at an object and asking “Does this spark joy?” If not, discard. While this sounds simple, I know it’s going to be hard. I do love this approach for clothing though, a lot. I still have stuff in my closet that I wore in college, my “cute days,” as I refer to them. I keep wanting to be the same size as I was in college – you know, long before I had 3 kids. When I try to remember what I think I looked like back then, I’m not sure it’s all that different than I do now…it’s silly, yes, I was thinner, but I was 18!!!! Marie also says in her book to thank the item for the role it played in your life and then let it go. A great example is a pink t-shirt I still have with a glitter chihuahua on it (ohmygoodness…two of my favorite things – glitter and chihuahuas, especially at that time in my life), and it’s a very small t-shirt. I loved this shirt, I wore it all the time and for some reason I still have it 18 years later!! 18 years?!!! I can’t believe I’ve had it that long! Why in the world have I held on to it this long? Partly because it has glitter on it (have I mentioned that I LOVE glitter?? ), and partly because it has a chihuahua on it, and I have 2 chihuahuas (the same 2 chihuahuas who are now 14 and 15 years old). More importantly, I keep hoping I’ll be able to get skinny enough to wear it again. I’ve not worn this shirt for probably 12 years – I don’t think I’ve fit into it for the last 13 years and I still have it. Marie says you should ask this question, “Does it spark joy?” It sparks really good memories of a time when I was itty -bitty and cute, but it also makes me sad because I don’t look like that anymore. Can I actually thank this shirt for giving me joy at the time I bought it and wore it, and be ok with letting go of it? I’m not sure….. When I really think about it, even if I could fit into it again some day, I’m not sure that I would even wear it, as it’s really short! :) 20 years ago short shirts were the fashion trend, but not anymore! I’m still really thinking about this one and I’ve not even started working on going through my closet yet!! My brain gets really far ahead of me sometimes. Anyways…back to my point – I’m a few days into my tidying journey and I’m selling things like a crazy woman! It’s nice! We are saving for a car, so the extra money I make on discarded items around the house all go into a jar sitting on my counter – the official “Car Fund” – hey, you have to start somewhere right?! I used to be a big fan of having a garage sale, so all year long I would designate a space in my storage room and/or the guest room and collect items we could sell. Once garage sale season would hit, usually late April, I would drag all my stuff out to the driveway and sell it all. Whatever was left after 2 days I would donate to Goodwill. Normally, we would save all that money for something big – one year we used it for a vacation to Legoland! 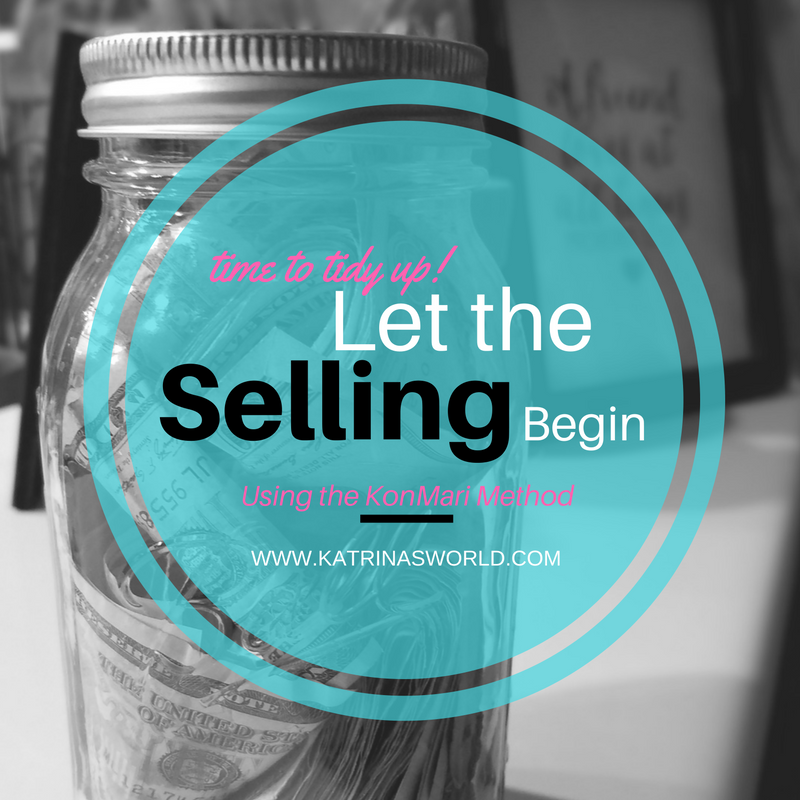 Now, I’m a more sophisticated seller – I like to use online selling apps to move my stuff and reach a bigger audience, and for some stuff I can charge a higher price than I would get for the item at a garage sale, which is awesome! My favorite selling app is VarageSale and I also use a few smaller local community Facebook groups. These groups are great because the seller comes to you to buy your item and for smaller items, I usually leave them outside my front porch with a nice note and the buyer just leaves money under my doormat. It’s very convenient and easy! If you get to know me well enough you know that I really love things that make my life easier. My kids have a snow day today – which means all 3 will be home, but I’m hoping that gives me a good excuse to get more tidying done since I don’t have to run them around. So, who’s used the KonMari Method? How did you discard items that were hard to get rid of? Any advice for me and my tidying journey? Have a great day! I’m off to try to tidy…. I’m happier than I should be that 2016 is over. I have no regrets about leaving that year behind me. It wasn’t a horrible year, it wasn’t a great year, it was just a year and I’m over it. I’m happy to welcome 2017 and have high hopes that it’s going to be epic! While I’m trying not to get ahead of myself or of what the Lord has in store for me this upcoming year, I’m still feeling very intrigued about what lays ahead. Last year was an “off” year for me. I struggled a lot with my emotions, my overall body contentment, and mostly with my sense of overall purpose and direction in my life. Heavy stuff huh? Yeah, I know, and it was hard to wallow through it all. I feel like dreams I had built, toiled over, and angrily suffered through were laid to rest, friendships were built and lost, days of pounding my body in the gym were accomplished with not much gain, and I registered defeat in more ways that I want to count. I learned that God doesn’t always write out His plans for your life on a neon sign, clear as can be, so you don’t mistake it – He just asks that you trust Him even when you have no idea what is going on. I was in that space so many days this year that I found myself doubting who God is and if He really is there for me – and in all my days on this earth, I have never doubted God’s love for me. Now do you see why I’m read for this year to be over? I learned something else about myself that I’ve never seen before – I don’t function well in chaos. I get stressed out really easy and it doesn’t take much for me to go from “good mommy” to “crazy-stressed-angry mommy” when the situation becomes overly chaotic. When I get stressed, I instantly go into overdrive of trying to de-stress – I clean my environment, I yell, I get mad at my kids, I start making lists, little things out of place make me yell even louder, I demand that my kids pitch in and help me clean, I just turn into a crazy person trying to tidy up and ultimately calm down. A classic example is everyday when my older kids get home from school. They come in the door and set their backpacks in the middle of the floor of the kitchen and start unpacking them, wanting to show me everything inside – the craft they made in class, their math test, the art project they are working on, their spelling homework, etc. All while my youngest (who has been home with me all day) is vying for my attention as well, wanting a snack, drink and to show me anything he can find at that moment to show me, plus he is usually singing a silly song about stinky farts at the same time (lovely – huh?). While all this is going on, I usually have music playing in the background (yep, because I’m crazy) and am trying to prepare a snack so we all can re-fuel before starting homework. This mom does not smile through all of this, nor do I patiently listen as they show me items, or do I calmly ask them all to sit at the table so we can eat a snack. I try to take a deep breath, then my heart starts to beat faster as I get more and more stressed by all the chaos of kids, dishes, dinner prep, laundry, homework, shoes in the middle of the floor, backpacks not hung up, etc and I end up yelling and throwing a mommy tantrum trying to get everything back to a normal stress level. This is so dumb. It usually puts the kids in a bad mood and me too and then we all spend more time trying to repair our attitudes towards each other. By this time, it’s 5pm, and I’m stressed and starving and all I want to fix my sour mood and chaotic feelings running through me is a brownie. Yep, I love brownies – but you all know that. I’ll make dinner and simultaneously whip up a batch of brownies. You see where I’m going?? It’s a horrible downward spiral. Chaos and stress are detrimental to me and where I’m going in life. I know I can’t eliminate all the stress in my life, I mean seriously, I have 3 kids, life is going to be stressful, but I can help identify the stress triggers and work at fixing them. A very dear friend of mine told me about a book she is reading, The Life Changing Magic of Tidying Up, by Marie Kondo. This book caught my attention because I love to organize and I love the feeling of a tidy house. 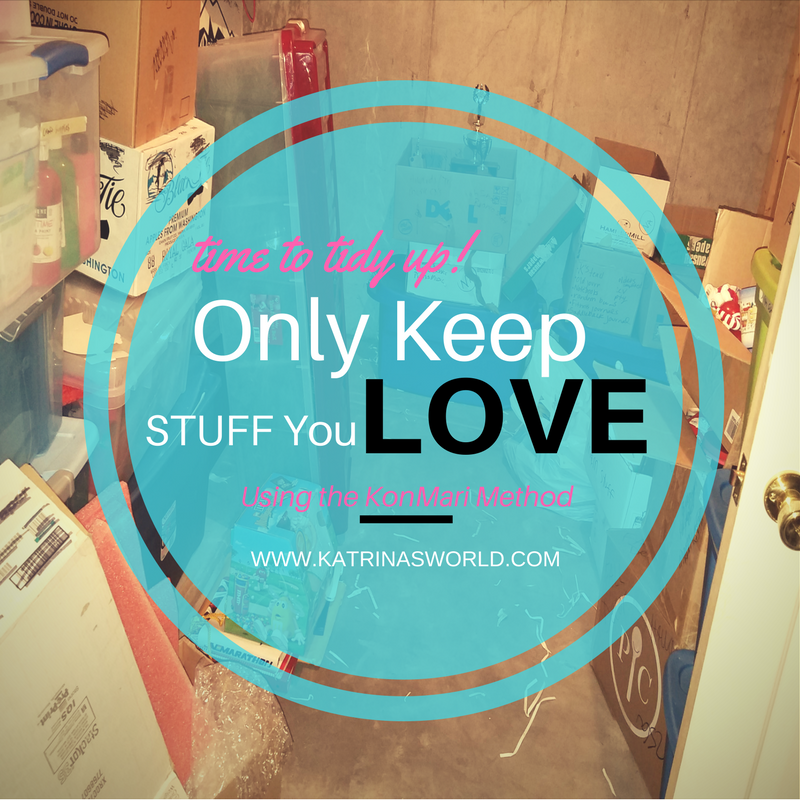 I love to discard stuff, sell it, and move on. My house is usually very tidy – but it could be so much more simplified. I’m totally hooked on this book. I’m only about 40 pages in, but I’m hooked! I’m going to spend the next couple months reading this book, doing what it says and tidying up my home, heart, and my life, and I plan to blog about as I go. In her book, Marie asks “Why do you want to tidy?” When you can answer that question you can begin. For me, I want to tidy to because I want to have a clean and orderly house so that I don’t feel stressed out by my environment. If I’m not feeling stressed out by my environment I can pay more attention to trying new things, having more fun with my family, eating healthier foods, getting better sleep, and overall being a better wife and mom. I do believe that all of these things can be accomplished by having a tidy home, because your home is so much more than just the place to lay your head at night. As a mom, it’s my work – it’s where I put my time and energy, it’s how I make money, it’s how I prove my worth, it’s who I am at this point in my life. I’m hopeful that God teaches me a lot about myself and the deep-rooted reasons why I do some of the same things over and over and expect a different result. I want change, which is really hard to say, because I HATE change, but I’m ready for it. Have you read Marie Kondo’s book? What did you think? What did you learn?